Each month we'll add a new block. To download pattern click on the name of the month you want below. 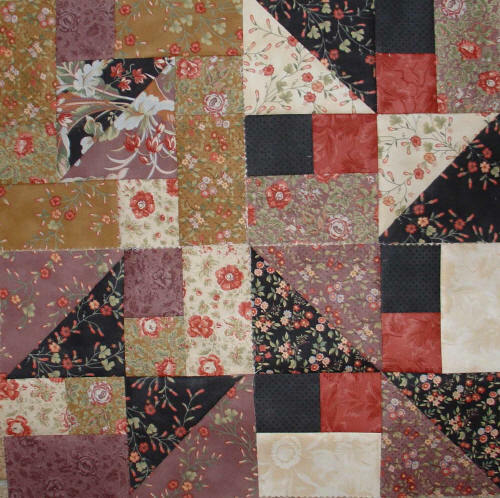 We also give an example of a quilt you can make with this block. The measurements are all in inches so if you need to change them to cm's, click here. Check out our page with free projects. Once again a series of 4, 8" square, blocks made with 4, 5" square, charms. Once again a series of 4, 8" square, blocks made with 4, 5" square, charms. If you look carefully you'll see that two of them are actually the same. Changing the order of the fabric used, changes the look of the block. A second series of 4, 8" square, blocks made with 4, 5" square, charms. If you're like me and you can't seem to resist buying charm squares every opportunity you get, you'll have a cupboard full of them by now. I decided to put them to use, so for the next few months you can expect patterns for blocks made from 5" charm squares. You will need 4 squares for each of these blocks. Have fun!!! We'll be adding a block with a jar each month so you can make your very own Jar's quilt. You can make this quilt with 25 blocks of the month January. You can make this quilt with 15 blocks of the month December. Variations with a block, check out the different quilts you can make just by rotating this block. You can make this quilt with 15 blocks of the month October. The quilt measures 40" by 24". You can make this quilt with 15 blocks of the month September. If you add 1 inch sashes and a 2 inch border and binding, the quilt measures 40 1/2" by 26 1/2". You can make this small quilt with 15 blocks of the month August. If you add a 1 inch border and binding, the quilt measures 17 1/2" by 11 1/2". Using 15 blocks of the month July 2005, you can make this quilt. If you use a 1 inch border and a 1/4 inch binding, the finished quilt measures 22 1/2 by 14 1/2 inches.